How do I get reciprocity? Ask an expert: How do I get reciprocity? About our expert: MovingSocialWork.org is your social work licensure mobility expert! Maintained by ASWB, the social work regulatory expert, the site gathers and shares valuable information for social workers on the move. 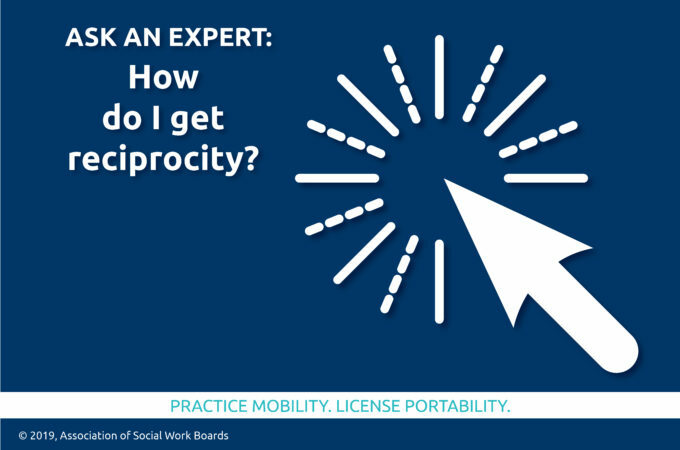 MovingSocialWork.org says: If you think of reciprocity as an arrangement among jurisdictions that automatically licenses social workers who want to practice in a new jurisdiction, then the short answer is that reciprocity does not exist. Practicing in a new location means following the rules and regulations of that jurisdiction and providing documentation of the three Es of licensure: Education, Exam, and Experience. Social workers have found that it is easier to move into some states than others, especially regarding the experience/supervision requirement. When states offer licensure by endorsement, and many of them do, that means they accept the social worker’s current license as sufficient evidence that the licensee has met some or all of the requirements for licensure. Licensure by endorsement streamlines adding a new license because, for example, the applicant may not need to provide original documentation of supervision. MovingSocialWork.org has compiled and created numerous resources for social workers who want to add a license. Start with these articles. Get smart about transferring supervision hours in Ask an Expert: Will my supervision hours transfer? Information on transferring exam scores can be accessed in Ask an Expert: How do I get my exam score to a new licensing board? Learn how to get started with the process of adding a license in Paperwork tamed: Mobility resources for licensed social workers. Get advice from administrators in Ohio and Washington, D.C., in Advice from administrators: Key information for social workers on the move and Advice from administrators: Similar practice, different regulation.